Electric service is becoming less and less reliable across most of the United States and Canada. Storms are growing in violence, while at the same time the capacity of electrical grids everywhere to meet needs is deteriorating. And there are other threats, ranging from geomagnetic storms to hostile attack, that could cause major outages. Your home is likely to go dark at some point over the next year, and might lose power for days or even weeks. And outages are most likely to occur when you, your family, and your home most need the protection from the elements that electricity helps to provide. Some people have gone off the grid altogether, but that's not practical for very many. Most of us must rely on the grid, but also need a way to supply power when the grid goes out. Fortunately there are options. Some are better – and more costly – than others, but there's probably at least one that can serve your needs adequately at a price you can afford. This Web site is here to help you understand what the choices are and how you can make the best choice. I don't have bets on any of the horses I describe. I don't sell hardware or services and I don't take any commissions from anyone who does. 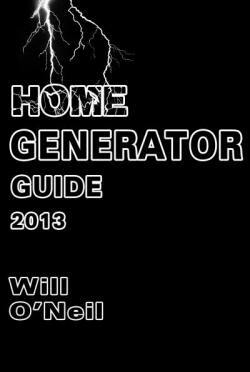 What I do sell is a book, Home Generator Guide 2013, that costs US$4.99 in electronic form ($7.99 in paperback) and provides a more in-depth treatment of the issues and facts than this Web site does (or could). I hope you'll buy it. If the information it provides saves you one percent of the cost of the very cheapest generator option then you'll be money ahead. If you're not familiar with electronic books you may wonder whether you have the device needed to read one. The answer is that you do – you can read it on whatever device is displaying this Web page. No matter what it is, Amazon has a free app that will allow you to read Amazon Kindle e-books that you purchase on it. And of course if you have a Kindle device, so much the better. Amazon allows you to try the Kindle e-book without cost by downloading and reading the initial part, including the informative introduction. Or, if you prefer, you can download the initial part of the book in PDF form, to read on your screen or print out. Broadly speaking, the options fall into three categories: a standby backup generator, a portable generator used for backup, or renewable energy sources with batteries used for backup. A standby backup generator packages a generator, an engine to drive it, and all the necessary services and controls within a single soundproofing (actually sound-reducing) enclosure that is permanently installed outside of your home. When your grid power goes out, it automatically comes on so you are never entirely without power for more than 30 seconds at a time. We're all familiar with portable generators, which many homeowners already have for jobsite or recreational use. A portable needs to be stored under cover, and for backup it must operate in a location safely distant from the house but protected from rain and snow and within electrical cord reach. There are several options for connecting it to your home — including one common choice that's very dangerous, and illegal. If you already have a solar electric panel or a wind turbine installation (or are planning to get one) it may be possible to modify the system to serve backup as well as prime power needs. Each of these options can take various forms depending on your location and situation. This Web site briefly addresses the major variations, while the book goes into greater depth and deals with a broader range of possibilities. We'll also take up noise. Installing a standby backup generator involves substantially more money and effort than a portable generator for backup. But the result is a system that is much more automatic, trouble-free, and safe. The choice depends on your needs, priorities, and resources. A standby generator will run on natural gas directly from your gas system – no need to get fuel. If natural gas is not an option for you then it can be fueled with liquefied propane gas or diesel fuel from a buried tank on your property. In any event it will be able to operate for many days, perhaps even weeks, with nothing more than a check of the oil every few days. 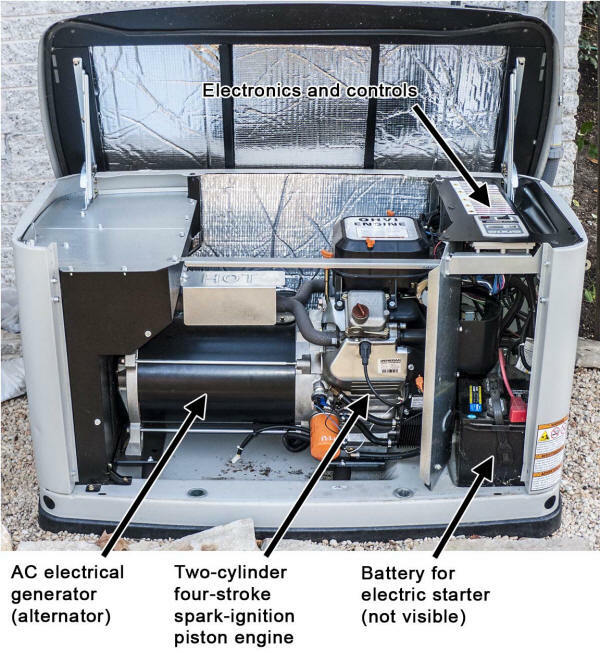 The photo shows a typical standby generator with covers open, revealing its anatomy. The first question is who's going to install the generator. The available standby units appear all to be of high quality; it's the installation that will largely determine how well it works and serves your needs. And the installation process will cost a good deal more than the generator itself in most cases, unless you do the work yourself. It is possible to install it yourself, with some help, as long as you have the requisite mechanical, electrical, and plumbing skills, and a good deal of time – and as long as your local jurisdiction does not require a licensed electrician to do the wiring. It's also possible that you might buy the generator, do all the planning and engineering, and hire and supervise all the individual tradespeople yourself. For the great majority of people, however, it will be worthwhile to hire an experienced contractor who will supply and install the generator as a complete system. If you have a competent contractor whom you can trust to do a thorough job and treat you honestly and fairly then your troubles are largely over. If you have one that does not fill this bill, they have only just begun. The book describes how to find a good contractor, and how to choose the best and most genuinely economical if several are available. It also tells how to save money by understanding which features you really need and which you may be able to do without. Your contractor will need to determine the correct size of generator for your home based on the electrical code requirements, but there are options. If you want to understand your power needs better, which can be quite valuable, you can Google for generator sizing calculator to find a variety of helpful sites. For a medium-sized home involving no special installation problems a complete system that will serve all of your key electrical needs may cost anywhere from $8,000 to $15,000, installed and ready to run. If you want to be able to run a 4- to 5-ton air conditioner on generator power, the price will probably be closer to the top end. In many cases it will be the starting current demands of an air conditioning (or other high-load system) that will determine the size of generator you need, not the running loads. The book explains this and tells how to determine the starting loads. If you have a larger house or special needs you may wish to get a larger generator. In general, they have lower-RPM engines with liquid cooling. You get not only more power but (in some models) quieter operation – and of course higher price. Above a power level of 20kW, expect to pay more than $20,000 for a complete installation. There are five major manufacturers of standby generators, and several smaller ones (whose offerings may be a better fit for some needs). A good contractor will probably have a brand it works with regularly and knows thoroughly. The manufacturers all claim superiority for their products, but I haven't been able to find much hard information to verify this. It's usually much more important to get a good contractor. Your needs can be affected by such factors as whether your home is at high elevation, located in a seismic hazard zone, in an area with extremes of heat or cold, or in a place vulnerable to flooding. The book discusses some of the issues involved. Using a portable for home backup involves a great deal more trouble on your part, but also a great deal less money. It also involves a great deal of potential risk – in an average year more than 70 people die in the United States in accidents related to portable generators. In Hurricane Sandy alone at least 16 perished due to misuse of generators in the coastal regions of New Jersey, New York, and Connecticut. Most of these tragedies could have been avoided by following proper procedures rigorously. Never operate a portable generator in rain or snow (unless it's in a covered place with a dry floor but with extremely good ventilation and safely away from any inhabited space). Make sure the generator is properly grounded in accordance with electrical code requirements. If your generator runs on gasoline or LPG (propane) from portable containers, be sure to store the fuel in a secure place, well away from any structure, and in accordance with local fire codes. Protect yourself against shock and burns while operating and servicing the generator by following safe procedures and wearing appropriate safety gear. Connect the generator in a safe and legal way, using a transfer switch (best) or approved extension cords. While it may be possible to rig extensions to safely power lighting and light appliances, there's no safe way to power a furnace fan, cooktop, or other hard-wired appliance except through a transfer switch. Never "backfeed" the generator by connecting it to a receptacle in your home. It's illegal and involves unavoidable dangers of shock and fire. If you follow these precautions carefully a portable generator should be reasonably safe. Just bear in mind that in all probability every one of those who has died from generator accident was aware that generators had dangers and imagined that he or she was playing it safe. There's a great deal wider range of choices for portables than standby generators. For less than $1,000 you can buy a small to moderate sized generator and several heavy-duty extension cords to connect a refrigerator, TV, lights, and a few small appliances, and for a little more you can add a single-circuit transfer switch to run your furnace. A 7500W generator with a manual transfer switch will power the most critical circuits in your home for under $2,000. To keep a selection of major loads in a medium-sized house running, including an air conditioner, you can get a generator with a capacity of 15kW or more and a 50A manual transfer switch for less than $3,500 (plus installation). Special features and capabilities will of course add to the cost. 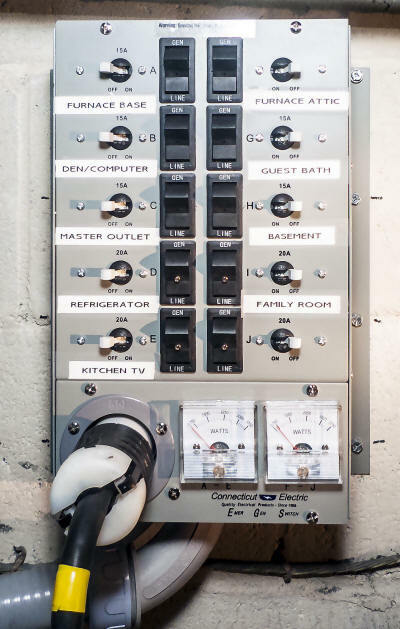 A transfer switch requires an electrical permit in most jurisdictions, and expert installation. and convenient way to power a selection of critical branch circuits from a portable generator. For simpler situations, with lower-power generators, there are simpler and less expensive transfer switches. For such a complex piece of equipment there's much to be said for buying from a local dealer, who can provide parts, service, and advice. But browsing online retailers can be useful in understanding what's available and what the price range is. Googling for portable home generators will provide many leads. The book also points to sources for generators to meet special needs, including generators running on fuels other than gasoline. There may be restrictions on the fuels that can used in your area, or on the specific generator models. Standby generators can be fairly loud, and all but a few portables are LOUD!!! Standby units usually don't bother you or the neighbors too much, but portables often are hard to live with, except at a considerable distance. Generator makers often give you a noise level measurement, expressed in dBA measured at a distance of 7 meters (about 23 feet) from the generator. These numbers need to be taken with a generous helping of skepticism. There's no standardized way to measure them, and noise is much too complex to be meaningfully reduced to a single number. At best, they're very broad guides. The actual level of noise will vary not only with the generator and the angle it's heard from but with the surrounding environment. And two different people may respond very differently to the same noise. There are a variety of ways to control noise, where necessary. On average, moving three times as far away will cut the loudness nearly in half, although this can vary depending on the situation and the hearer. Solid barriers can block noise to an extent. And some materials can absorb it to an extent. In most cases, however, where noise is critical it is best to start with a quieter generator. Usually this means a standby generator, but there are some quiet portables as well, at least in sizes of no more than 6500kW. Your community may have an ordnance governing noise that could limit generator use, particularly for a portable. It's a good idea to bear in mind that the benefit you're getting from a generator is likely to be costing your neighbors something in terms of noise and annoyance. Sharing some of the benefit, doing what you can to limit noise exposure, and being considerate about not running a noisy generator at night can help. All these issues are explored in depth in the book. If you have a solar photovoltaic (PV) or wind power system that's not connected to the utility grid, it already provides its own backup. It will have a bank of batteries to provide power when the sun isn't shining or the wind is still – and at the same time smooth out the fluctuations in power from the PV or wind generator. But if you have a grid-tied renewable energy system, it will automatically turn off and be unable to serve you when the utility grid it's connected to fails. It's an important safety feature, preventing dangerous backfeeding. A grid-tied system can be converted to a grid-tie with battery backup, or grid-interactive system by adding a bank of batteries and a battery controller, as well as modifying or replacing the inverter. Unfortunately, this adds considerably to the cost of your system. From an economic perspective it may be more attractive to add a standby or portable backup generator instead. If you have a comment or question, please e-mail me.